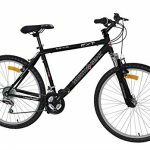 The FalconEvolve 18 Speed Unisex Mountain Bike is a versatile mountain bike suitable for both men and women. The androgynous design allows it to be easily used by both sexes and does not lend itself to either a masculine or feminine look and feel. 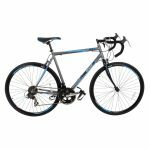 The bike itself is lightweight and proves ideal for use on roads, paths, and off-road trails on the mild to moderate end of the scale. The 18 gears provide more than sufficient speed and levels of intensity and make it a fantastic choice for everyday use. In fact, the FalconEvolve proves to be a great all-rounder and would be ideal for a commuter bike for everyday use. If you are looking for a bike that offers both power and speed, then this is the bike for you. The FalconEvolve 18 Speed Unisex Mountain Bike is a fantastically versatile bike that can be used on a whole array of terrains and surfaces. The bike itself features a traditional rigid frame, which is made from tough and durable steel. Coming in at just 18kg, the FalconEvolve makes quick work of various surface types and offers maximum speed and maneuverability. The lightweight materials of the bike also make it a cinch to pick up and carry when required, regardless of your strength. Next up, we have the semi-slick yet thick tires, which provide a much smoother riding experience than traditional MTB tires. This makes on-road riding a joy and removes they usually vibrating effect associated with other tires. The 26-inch wheels and the addition of 18 gear speeds mean that the FalconEvolve 18 Speed Unisex Mountain Bike can attain fast speeds with ease. It also allows for uphill riding and takes out much of the energy required for doing so. The high-quality V brakes give the bike the ability to stop in the quickest and safest time possible and removes the risk of being thrown over the handlebars when doing so. The handlebars and saddle feature comfortable and soft padding, which means that you can spend hours on your bike without the usually associated blisters. If you are looking for a strong, durable and stylish mountain bike, then the FalconEvolve may be just what you have been searching for. The FalconEvolve 18 Speed Unisex Mountain Bike provides everything that could ever be wanted from a mountain bike and offers up a smooth and controlled riding experience. Regardless of whether you intend to ride on the roads or hit the off-road trails, this bike will ensure of a safe and enjoyable experience. The fact that it comes with its ingenious handlebar and saddle gips and padding means that you can rest assured of getting maximum comfort when using it. Being unisex means that the bike is as good for men as it is for women, making it a fantastic choice for families who would rather share a bike than own one each. Does The Bike Come Fully Assembled? While the bike comes part assembled, the actual assembly of the bike is easy and will take no time at all to do. You will also find an alan key and a multi-bike wrench enclosed with your delivery, so you will not need to go out and purchase any additional specialist tools. The provided tools will also assist in any future adjustments or maintenance and help you make the most of your bike for many years to come. 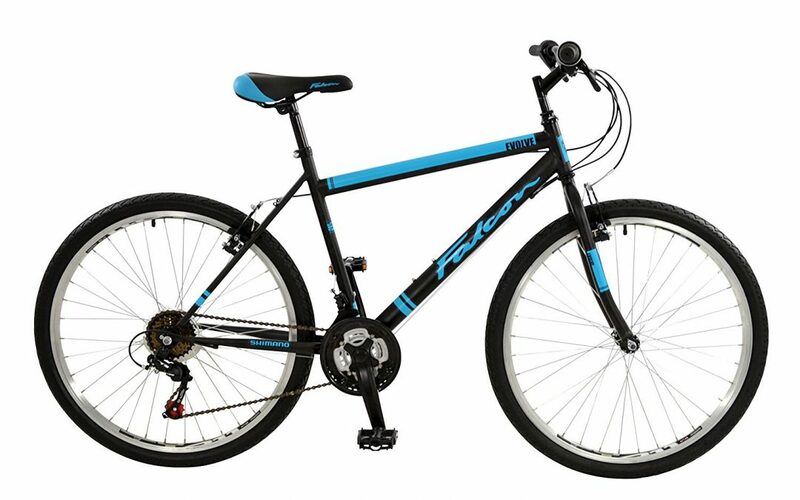 The main dimensions of the FalconEvolve 18 Speed Unisex Mountain Bike are as follows. The wheels are 26 inches and made of alloy rims. The frame of the bike measures in at 19 inches and is made from strong and durable steel. The total weight of the bike is 18kg, which allows for it to be easily picked up and moved by most people of most ages. All in all, the dimensions of all of the components of the bike have been designed to create maximum comfort while retaining a high level of style. Is This Bike Suitable For Children? This will primarily depend on the age and height of the child. The FalconEvolve 18 Speed Unisex Mountain Bike is created with older children and adults in mind. Therefore, the bike will prove to be of an ideal size for most children aged 12 years and older. Read the helpful and informative guide on the Factors to consider when buying a mountain bike. When you first receive your FalconEvolve 18 Speed Unisex Mountain Bike, you will need to assemble certain parts, such as the front wheel and saddle. At this point, you can also make any adjustments to the handlebars and saddle height and adjust the gears and brakes to suit your preferences. Regular maintenance of the gears and chain is recommended, as with all bikes, this helps keep it in perfect condition. Ensure that the tires are well inflated and have adequate pressure and clean your bike after heavy use in areas of mud, snow or sea water. Storing your bike in a dry location will help prevent general weathering as experienced with all bikes. This will allow for many years of enjoyable and safe riding. Check out our bike lock guide article. The FalconEvolve 18 Speed Unisex Mountain Bike is the perfect bike for the whole family and can be comfortably used by both men and women. Its design allows for continuous use and limits the amount of expected wear over time. It also provides a versatile riding experience and can be used in lots of different types of terrain, including biking trails, roads, paths, and on either wet or dry ground. The FalconEvolve is also a great choice for the greener family who are looking to commute to work and school via bike rather than by car or public transport.